Se verdens ledende hyllest til BBCs Fawlty Towers TV-serie på Faulty Towers The Dining Experience, to timer med strålende moro i hjertet av Londons teaterland. Gå til Radisson Blu Edwardian Bloomsbury Hotel og nyt et unikt teatralsk skript, lynrask improvisasjon og en 3-retters lunsj eller middag - for ikke å nevne sjokkerende service og morsomme teatralske scener. Gjør din egen vei til Radisson Blu Edwardian Bloomsbury Hotel, og sjekk inn på Torquay Suite Theatre. Forbered deg på en morsom middagsopplevelse skapt i hyllest til Fawlty Towers, den elskede britiske sitcom skrevet av komedie legender John Cleese og Connie Booth. Ankomm tidlig for en drink i Basil's Bar (egen regning). Mayhem begynner når hotellinnehaveren Basil kommer på scenen for å prøve å mikromanage Manuel, den langvarige, elskede servitøren fra Barcelona. Heldigvis er Basil kone Sybil klar for at både han og Manuel blir tatt i kontroll akkurat nok til å kunngjøre sitteplanen. Skuespillernes oppdagelser utfolder seg mens du spiser, med denne komedien som leker rundt deg. La deg som du spiser og smaker smaken av retter som rik tomat og basilikumsuppe, stekt kylling med sesongens grønnsaker og overdådig sjokolademousse kake til dessert. Vær oppmerksom på at Faulty Towers The Dining Experience skildrer ånden til Fawlty Towers TV-tegnene og atmosfæren de lager, men utøverne er imitatører og showet har ingen forbindelse til BBC, heller ikke til John Cleese, Connie Booth eller deres TV-skript . Rik tomat og basilikumsuppe med hjemmebakte brødruller og smør. Stekt kylling med stekte poteter og friske sesongens grønnsaker. Merk: Dette er en eksempels meny, med forbehold for endring. Vegetar og spesielle kostholdsmåltider kan bestilles på forhånd. Det var fantastisk morsomt! Vi lo oss gjennom middagen. Hadde med datter på 11 som hadde det kjempegøy. Anbefales! Fautly Towers was set in a Torquay Hotel where comedy events took place.  This Experience took place in a depressing dark grey room used for corporate conferences with NO attempt made to add any ambiance to the scene. It was like attending a play with no scenery. Maybe a few Torquay posters and pictures, the odd plastic plant would have set the scene, how about some awful hotel canned music during the pre - amble - probably too much trouble! We therefore sat down in this dreary room to be entertained by three look alike actors who, with the exception of Sybil seemed incapable of leaving the script and involving the audience a few attempts were made but highly scripted and never impromptu. Where Manuel standing on a table singing Via Espana fitted in is anyones guess! The script was laboured and not the anticipated fast moving comedy we had expected. The concept is fabulous but lets look at details and make this a proper Production. Very amateurish and not worth anything like the amount charged. I felt so disappointed, I also felt insulted by the don't care attitude of the production team, i.e. turn up, do it, go home! Great show and a good evening . 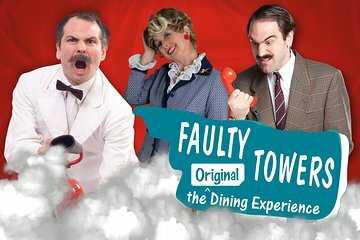 My wife and I rounded off a long weekend break in London with a much anticipated visit to the 'Faulty Towers dining experience ' staged at the Bloomsbury Hotel. Delighted to say this did not disappoint with two hours of madcap antics and fun delivered by a very clever trio of professional actors in the guise of Basil and Sybil Faulty and the the hapless Spanish waiter, Manuel. Together they did a great job of blending together and re-creating many sketches and scenarios from the iconic TV series - bringing hilarity to the proceedings and very skillfully picking on some of the attending diners to take part. Any fears that this could be overbearing or intrusive was immediately allayed because it was clear they knew, instinctively, who to 'pick on' without causing offence. And because this was staged in London with a very broad spread of overseas 'diners' in the room it brought even greater authenticity to 'Basil's' loony dialogue and manic behaviour. Full marks to the guy who played Manuel, because he really could have come from Barceloooona my wife was delighted when he crept up behind her to show her his hamster !!! And Sybil was as formidable as expected - a delightful battleaxe reigning over a room of slamming doors, flying bread rolls and chaotic service. Our verdict: Great fun, lots of belly laughs and very professionally produced. And two extra bonuses - the food was good and the other four guests on our table , who we only met on the night, were very nice, interesting company. Hilarious! Great entertainment! Meal was good. Would highly recommend. It was ok but by the end you've had enough! Food was pretty average. Characters were excellent... stayed true to the show, and engaged the audience members. Food was quite good as well. Venue was hard to find,bar was too crowded to see the initial action.Amusing show with ordinary food.Could be funnier.